McCullum reached 200 with his 11th six from the 186th delivery he faced and was out two balls later for 202. 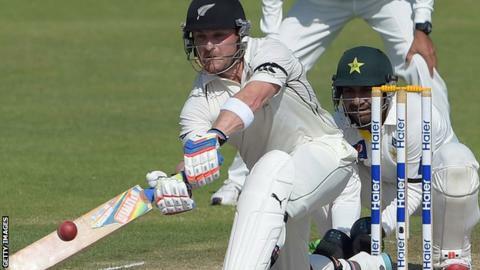 With Kane Williamson also making 192, New Zealand closed on 637-8, a lead of 286 in their bid to level the series. The partnership of 297 between McCullum and Williamson is a New Zealand record for the second wicket, while the total of 19 sixes hit by the Black Caps is also the most in a Test innings. For McCullum, the double hundred is his second of 2014 to go with a triple hundred, a trio of scores only previously matched in a calendar year by Sir Donald Bradman. McCullum is a former team-mate of Phillip Hughes, the Australia batsman who died on Thursday. The New Zealand team have written Hughes's initials on their shirts and, at the end of the day, McCullum released a statement on behalf of the Black Caps. "Our focus at the moment is not on our performances, it is all about Phil. "We are heartbroken for Phil's family, Greg, Virginia, Megan and Jason. No one should go through what you guys are going through right now. "You are all in our thoughts, our hearts and in Phil's case, our memories." Pakistan lead the series 1-0 after victory in the first Test in Abu Dhabi.